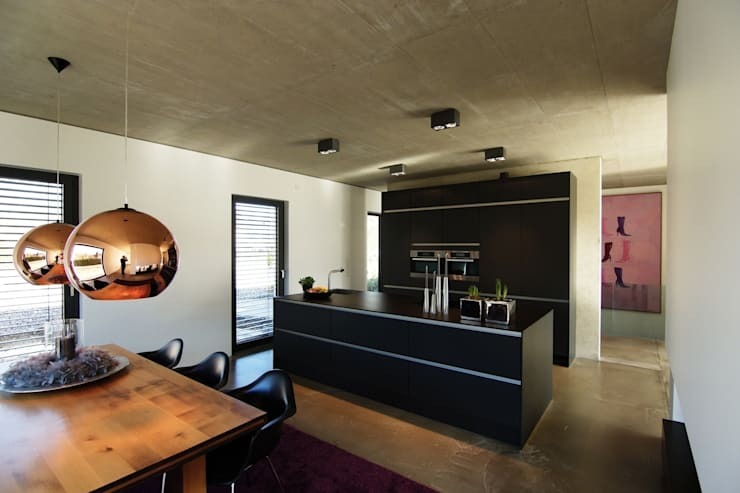 Aprikari GMBH & Co. Kg have created this sassy little house in Viersen, Germany that comes with buckets more attitude than its fairly unassuming exterior suggests. Here, we take a look at the many surprises it holds. The outside of the building, although pretty, is certainly far from opulent. Low roofs and simple white walls suggest that this is a bungalow that doesn’t want to get above itself. There are signs of a good life to be seen even in this relatively far-off shot, however; largely in the form of all that super-comfy, original seating scattered around the patio. Seen from the street, the house appears to be even more reserved, hiding quietly behind a high wall. In the bedroom, however, things suddenly take on a whole new aspect. 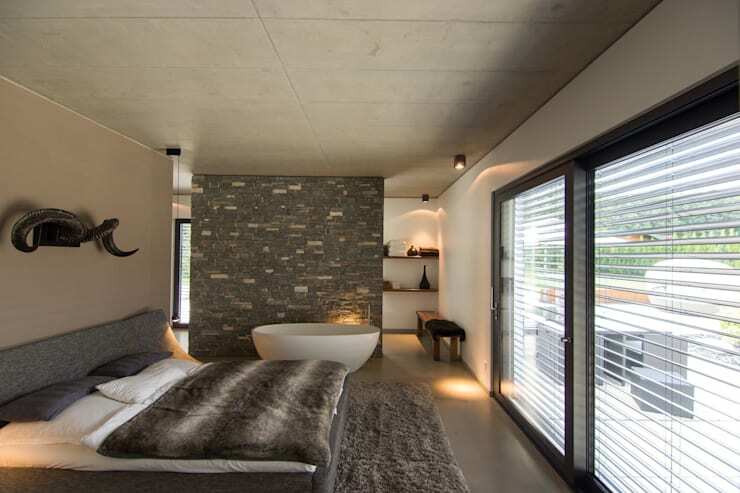 The ram’s horns mounted on the wall, the exposed stone feature wall, the furry cover on the bed… . all suggest that this is no dull retirement bungalow. Most impressive of all, of course, is that gorgeously simple bath tub, always at the ready for a quick pre-or-post bed dip and plenty of romantic evenings in for the couple who occupy this room. 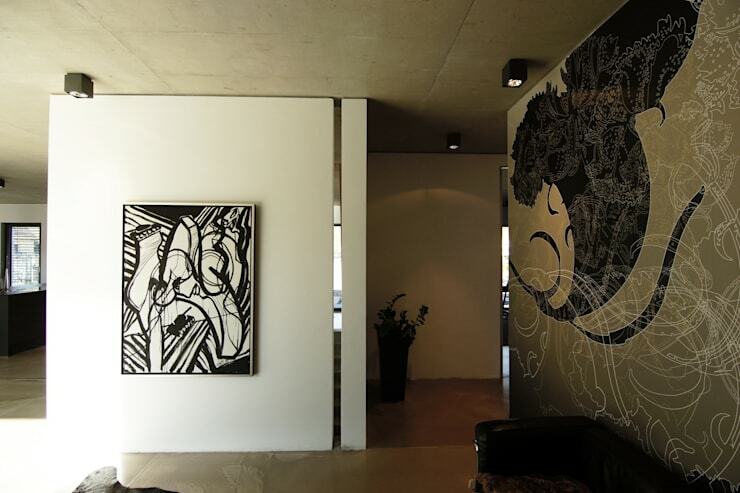 Art features heavily throughout the house – both mounted in frames, as is traditional, and stencilled directly on the wall as with the intricate design on the right. The copper-coloured lampshades that dominate this room seem like a good visual metaphor for the bold, original but still classy look of the entire interior. 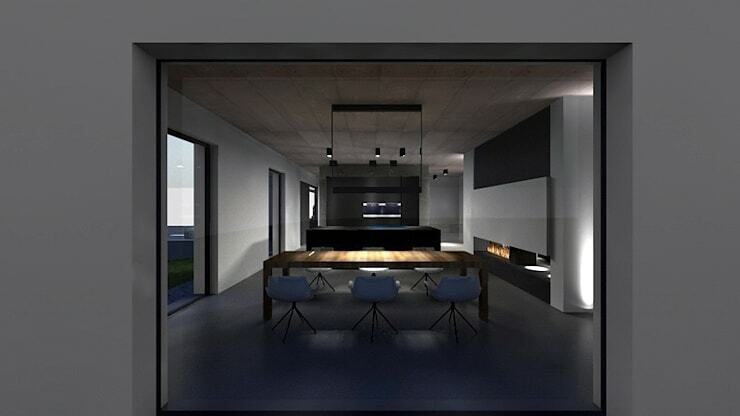 However, the sharply modern look of both this lighting and the powerfully dark kitchen units beyond is tempered slightly by the simple wood design of the dining table. In another dining space elsewhere in the house, taking a look from a particular angle reveals the importance of straight lines, careful measurements and symmetry in the designers’ vision for this interior. 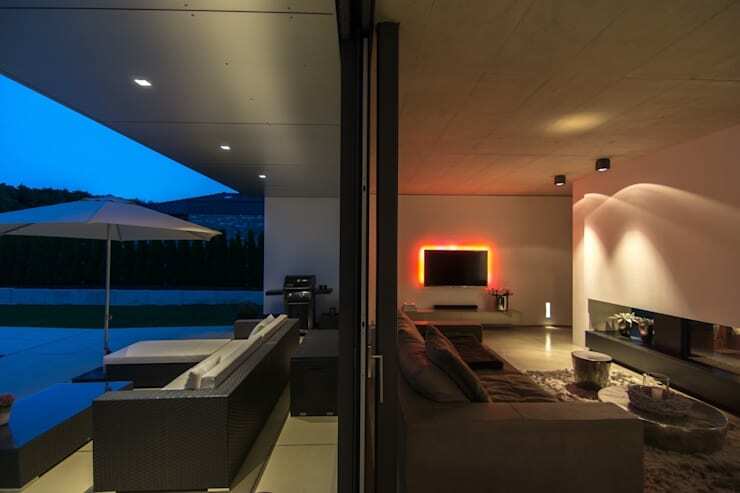 Again, when we see the patio area and the living room like this – dividied only by a glass door – we can see how much thought has been given to balance, with the outdoors carefully mirroring the interior space. 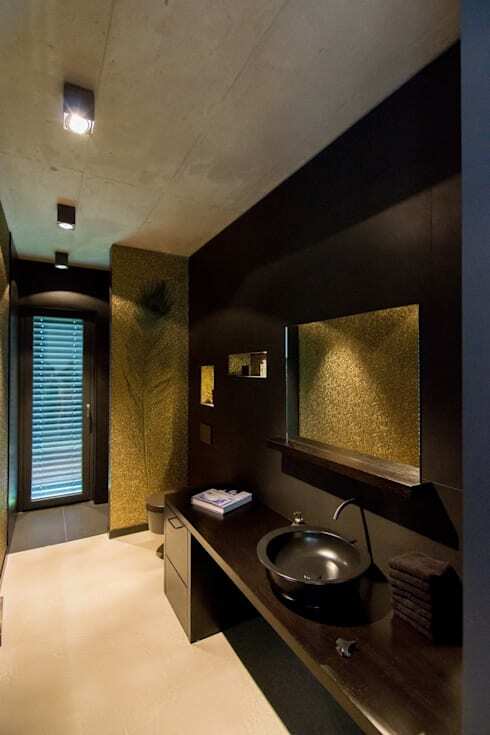 In the bathroom, the gentle mood created by soft lighting and gentle, moody shades is further enhanced by the use of an oversized feather design placed stencilled lightly upon the wall. 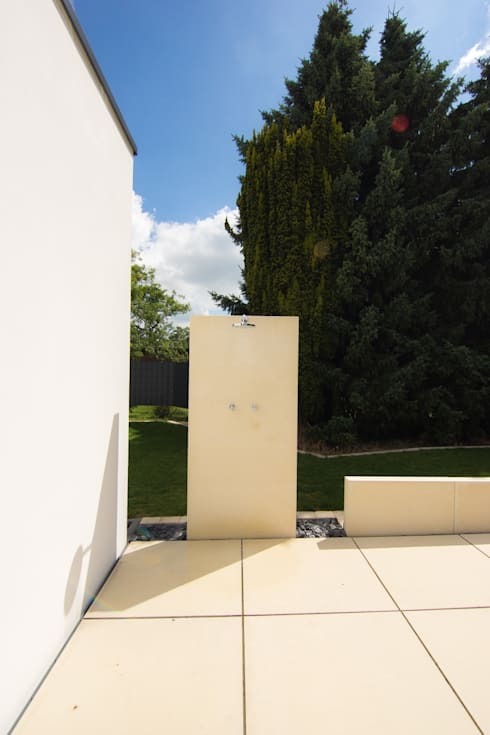 And there are more washing facilities to be found outside, this time in the form of this beautifully simple outdoor shower, which facilitates a peaceful, nature-filled start to every morning. What do you like about this project? What don;t you like? Tell us here.